Celebrate 50 Years of Epiphone's Classic Casino™! Epiphone is known for producing some of the greatest and most innovative musical instruments in popular music over the last 100 years. While models such as Masterbilts, Broadways, Wilshires, Coronets, Emperors, and Texans are some of Epiphone's most memorable models, the Casino is arguably the most famous due to its close association with The Beatles. Now, Epiphone brings back the very first Casino in celebration of its 50th anniversary - the "1961" Casino. The new 1961 Anniversary Casino has many features that were discontinued after the first year of production. The 1961 50th Anniversary is a classic that will be both familiar and totally new even to Casino lovers like Paul McCartney, Paul Weller, Gary Clark, Jr. and Keith Richards. 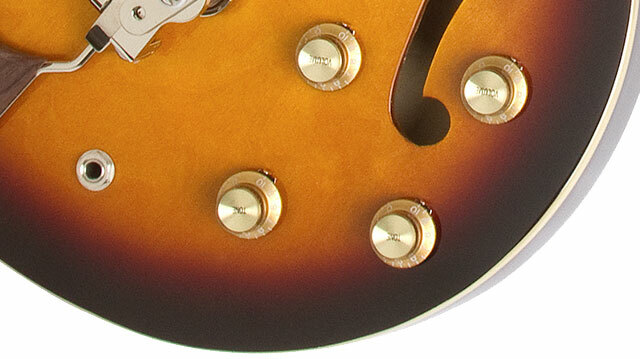 As with every Epiphone, the '61 Casino also comes with the peace of mind you get from a Limited Lifetime Warranty backed by Gibson Musical Instruments famous 24/7/365 Customer Service. Maybe it’s purely coincidence that at the same time that the Casino was in its planning stages at Epiphone's headquarters in Kalamazoo, Michigan, The Beatles were starting their historic run at Hamburg's Star Club. By 1964, the Beatles were stars and when Paul McCartney went shopping for a new guitar that would feedback like his favorite blues records, he reached for a Casino. John Lennon and George Harrison soon bought their own and used their Casinos on stage and at Abbey Road throughout the rest of the band’s career. Carl Wilson of the Beach Boys, Paul Weller of the Jam, and Noel Gallagher of Oasis are just a few of the players who have made great records with Casinos. Production records indicate that only 176 Casino TD's (trapeze) and 153 Casino TDV's (Tremotone™) were made in 1961 so if you happen to have an original, you not only have a very rare instrument but a valuable one as well. Today, original 1961 Casinos sell for $5,000 or more. So if you don't own one, now's your chance! But don't wait too long. 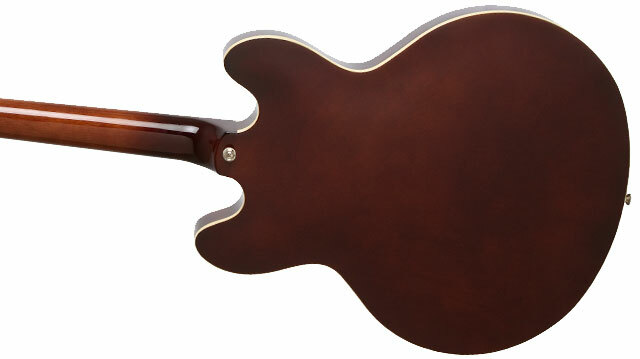 Epiphone is only making a total of 1,961 Anniversary Casinos and once they're gone... they're gone! Introduced in 1961, the original Casino had unique features that ultimately were never offered beyond that first year including the pre-Gibson era triangle metal logo badge on the headstock, "dot" fingerboard inlays, a blank two-ply "bullet" truss rod cover, a tortoise-colored pickguard with foil "E", and black dog-ear P-90 pickups originally designed by Seth Lover. Epiphone has faithfully reproduced these features for a one-of-a-kind retro look not found on Casinos produced after 1961. Other details includes the correct "burst" patterns on front and back, a neck joint at the 16th fret (instead of the 17th), Wilkinson™ vintage-style machine heads with white buttons, and the historically accurate rectangle "blue label" inside the sound hole. 3-way toggle and 1/4" output jack. =P-90’s were a favorite among jazz players for their clear horn-like tone. A young jazz student in 1961 could put on some flat wounds (and perhaps an unwound third if the teacher wasn’t looking) and hear the tone of Barney Kessel, Tal Farlow, or maybe even Charlie Christian. Unlike an ES-335, the Casino is completely hollow which contributes to its unique signature sound made most famous by The Beatles. The body is made of 5-layer maple/Birch with a solid mahogany SlimTaper™ neck attached using the traditional mortise and tenon neck joint hand-fitted and glued to the body using TiteBond™ glue. 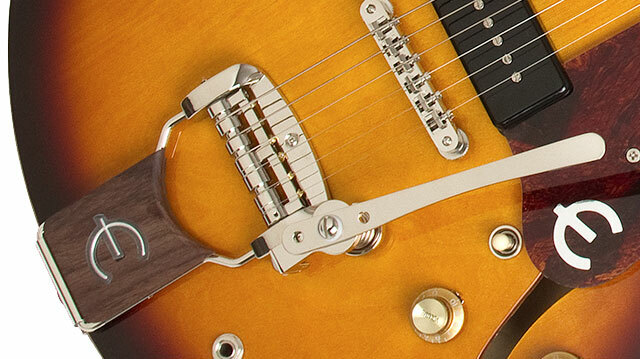 Hardware includes a Tune-o-matic bridge and your choice of either a Trapeze tailpiece or Epiphone's new reissue of the original Tremotone™ vibrato. Cool! To top it all off, each 1961 Casino features an original-style hard case with gray exterior and blue plush interior and a numbered certificate of authenticity.